When I crest Hannah Heights, I get my first view of the water on the west side of the island, and I instictively look left along the southern part of the shoreline to see if I can spot any whale-watching boats. 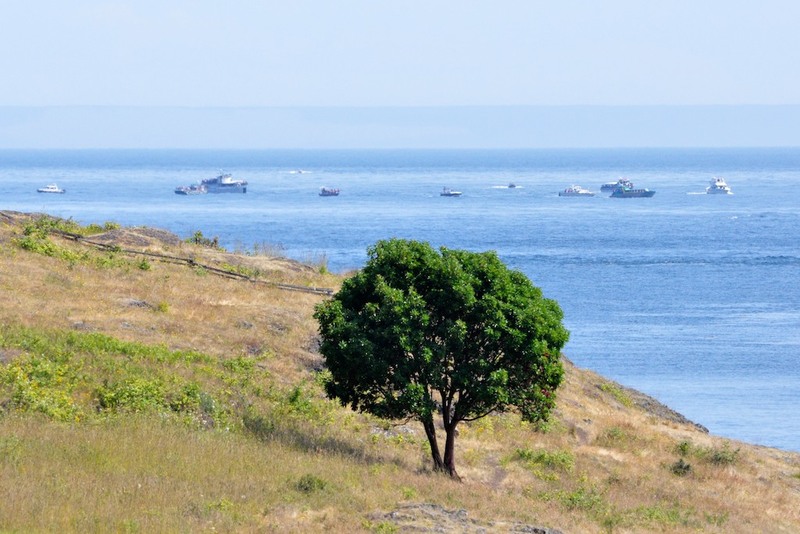 I see a cluster of boats right off of False Bay, all facing the same direction. That split-second look is enough to tell me that the whales are in a tight group heading north, right towards where I plan to be. I'm the only car in the north pullout at Land Bank's Westside Preserve. I know that will change as soon as the whales come into view, but for now I seem to be the only one anticipating what's to come. I grab my backpack which doubles as a camera bag, my handheld VHF radio, and my hat out of the trunk before walking down the sloping hill with yellowing grass towards one of my favorite perches on the rocks about twenty feet above the water. It's officially a few weeks into summer, but this is one of the first days it's warm enough to be out by the water without a sweatshirt or a jacket. The rest of the country has been experiencing record high temperatures for weeks, but here it's finally reached 70 degrees and to me, it feels plenty warm. It doesn't take long for the boats to start coming into view as they make their way around the point to the south. I'm a strong believer in eco-tourism and a full supporter of whale-watching, but I must admit that the sight doesn't please me. There are more than twenty commercial whale-watching boats from both the US and Canada clustered around this group of whales, each trying to edge in right to the agreed-upon quarter-mile buffer they give the whales along the shoreline on this part of the island. The fact that so many people want to see whales in the wild is a good thing, especially considering the education that's provided by naturalists on nearly every boat in the fleet, but it looks a lot like celebrities being mobbed by their paparazzi. I see the boats a good fifteen minutes before I see the first sign of any whale. By the time the first whale is approaching my spot on the shoreline, other people have figured out that a whale encounter is imminent. 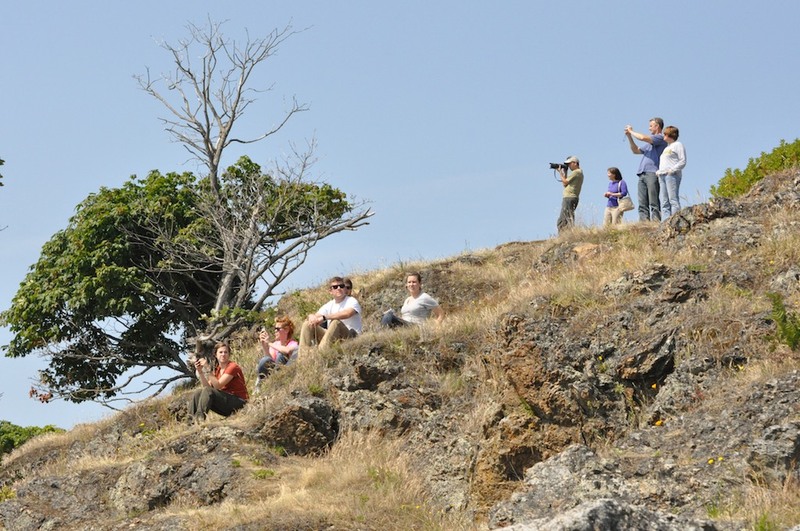 I turn around and am surprised to see that thirty or forty people crowd the shoreline above me. Many are eagerly pointing or taking pictures as the whale passes us by. 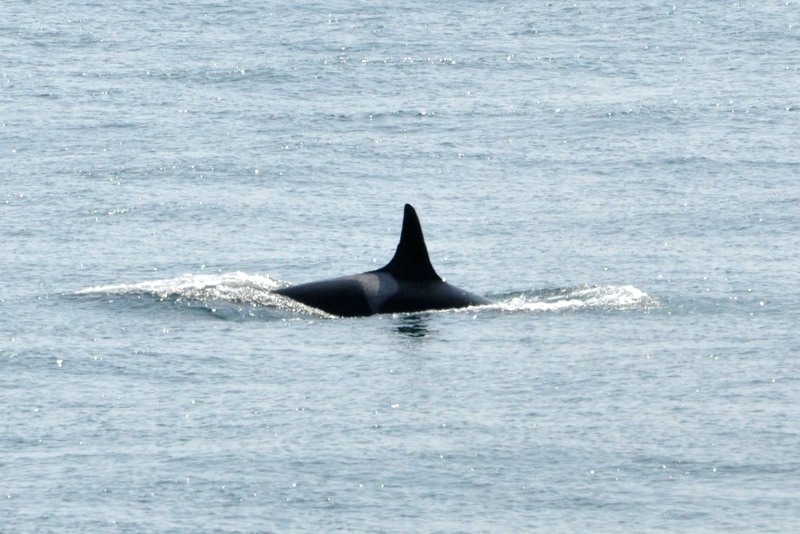 She surfaces right in front of me about 200 yards offshore, and the half-moon shaped notch in her dorsal fin tells me its J2 Granny, often in the lead when J-Pod travels through Haro Strait. I described the whales as being in a tight group, which in this case meant they were all within about half a mile of each other, though still somewhat spread out. Some animals were further offshore, too far away to ID in the harsh afternoon sunlight, but after Granny another group swims in closer to the kelp. I'm not surprised to see its J8 Spieden, J19 Shachi, and J41 Eclipse, three whales who often travel close together and never roam too far from Granny. Like Granny, the trio is moving north at a good clip, by they have a little bit of a more playful attitude. Shachi tail slaps, and her daughter Eclipse rolls onto her side at the surface, swimming sideways with her pec fin in the air for a moment. 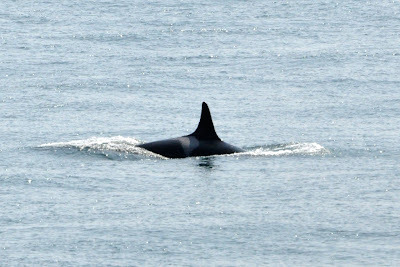 I'm always overjoyed to get a good look at “my girl” Eclipse, a whale who is special to me since I saw her shortly after she was born in early July 2005. She's just turned seven, and has grown so much that soon it will be more difficult to tell her apart from her mom who she still swims beside. I notice Eclipse's dorsal fin has started to take on the same curve along the top as Shachi's. 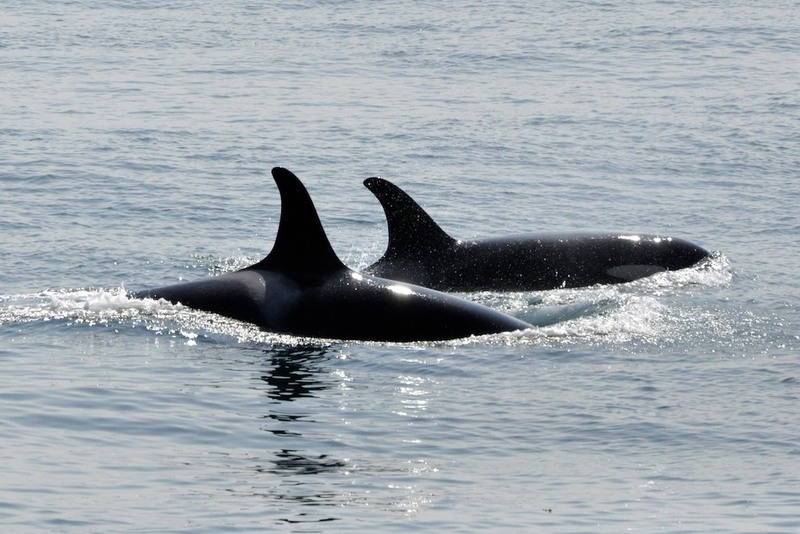 There are 30 whales present – all 25 members of J-Pod and five L-Pod whales that have taken to traveling with them. 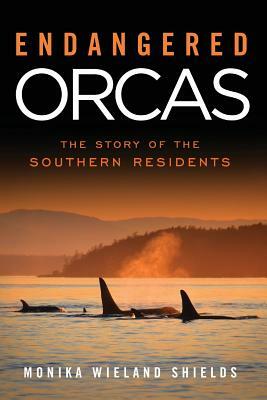 This is about a third of the total Southern Resident Community of killer whales, probably the most heavily-watched group of whales in the world. I take a moment to watch and listen to all the people watching the whales. “Are these orcas?” Somebody above me on the rocks asks. “I think they're migrating north right now,” a third person responds. The onlookers clearly don't have their facts all straight, but in the moment, that doesn't seem to matter. I look out to the boats to survey the scene on the water. I know from experience it always looks worse from shore than from the water, and that the whales don't obviously change their behavior regardless of how many boats are present, but today it does look bad. I count 37 motorized boats around the whales – more than one boat per whale – and on top of that are more than a dozen kayakers in shore. One group of whales has indeed turned around, and as the whales spread out, the boats do too and the marine radio at my side flickers to life. The jargon of the whale watch captains takes a little bit of deciphering to understand. “They've stalled out at the Light,” reports one captain, meaning one group of whales near the lighthouse has stopped traveling north. “I've go the leaders at 14, still northbound,” responds another, using the numeric code the whale watch companies have agreed upon to indicate his location. Over the course of the next hour, the whale watch boats peel off one by one and head back to their home ports: Friday Harbor, Orcas Island, Port Townsend, Victoria, Cowichan Bay, Vancouver. The people clustered on the shoreline begin to head back to head back to their cars, too. There are still whales in front of us, but the boats have reached the end of their trip times and the shore-based whale watchers, having seen the whales, are ready to move on. I recall a passage in a children's book I read recently that described a field biologist as someone who spends hours of their days and years of their lives watching animals. I realize by definition I fall into that category. Experience tells me not to leave – for whatever reason, it seems 9 times out of 10 the best moment of a whale encounter comes when almost everyone else has tired of watching and leaves. 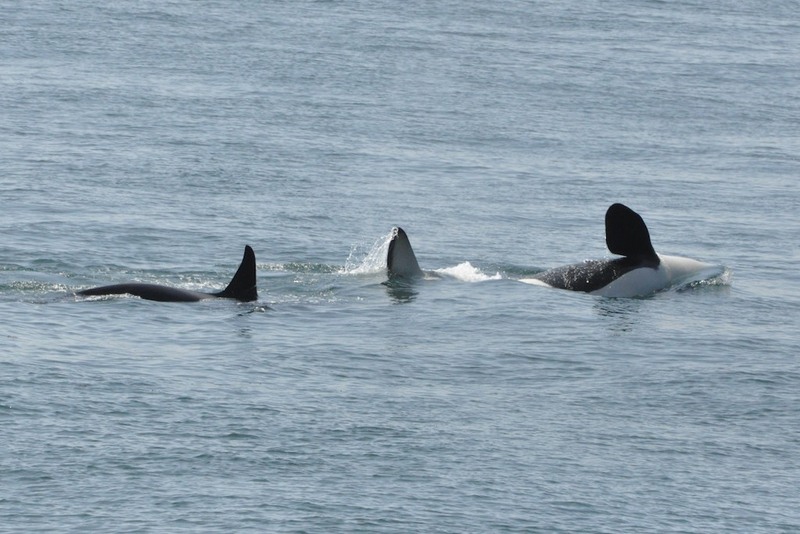 The vision of the fleet of whale-watching boats clustered around J-Pod is still in my mind, but it hasn't taken long for the scene to totally change. Some anti-whale-watching agencies paint pictures of the whales constantly mobbed by boats, unable to feed or travel or play away from their adoring public and the loud engines that accompany them on the water. The actual impact of large numbers of whale-watching boats on whales is still being studied and is debatable, but in more than 10 years of observation I haven't seen anything drastic to indicate that boats are the reason this population of whales isn't increasing. The facts also show that for half the year, there are no boats with the whales, and even now, during the peak season, the large quantities of boats are condensed over just a few hours of the day. It's late afternoon on a Friday in July, and we've gone from more than 50 boats on the water with the whales to just two boats in an hour's time. 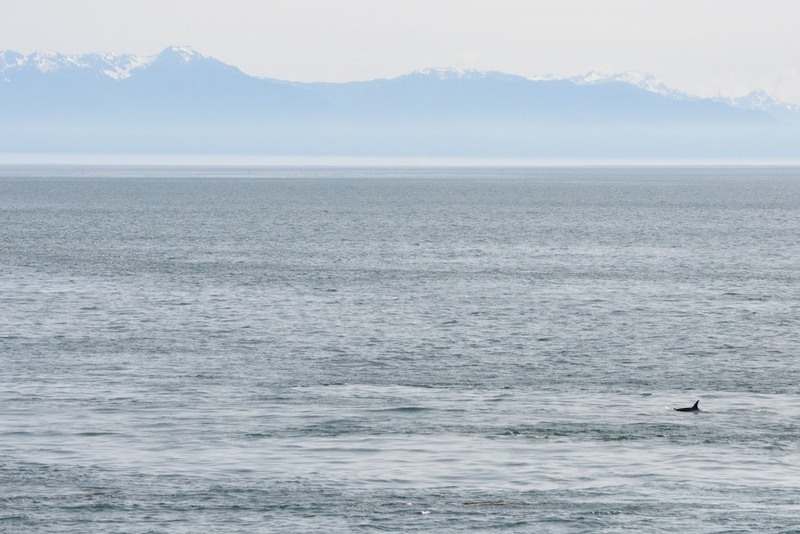 Some of the whales I see surfacing out in the middle of Haro Strait don't have a boat within a mile of them. Gone, too, are the tourists on the shore who flocked to see them. 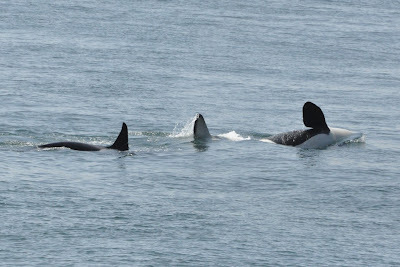 A mom and calf surface with nothing but the Olympic Mountains behind them. I turn around to look above me, and the only other observers are three women sitting on the guard rail by the road, binoculars in hand. A moment later a loud “kawoof!” breaks me out of my reverie. I'm surprised to see a whale in Deadman Bay swimming back south towards me. I turn around to see if the women are going to come down closer to the water to get a better view, but they're gone. Amazingly, I'm the only one who is going to see this. “Where did you come from?” I ask out loud. It's J34 Doublestuf, one of the first whales that passed heading north. I figured he would be heading back this way at some point, because his mom and younger brother never went all the way north, and if the pod split, he wouldn't go north without them. He surfaces again, right in the sun track across the water, and I can only look in his direction because I'm wearing my polarized sunglasses. Somehow, completely silhouetted, it's easier for me to appreciate the size of his dorsal fin. He's only 14, but he's well on his way to having the tall dorsal fin of a fully adult male. As he glides by underwater, he's close enough that I can make out his gray saddle patch through the gray-green water and follow his movements from above the surface. “I think they're just going on super long dives,” the other responds. 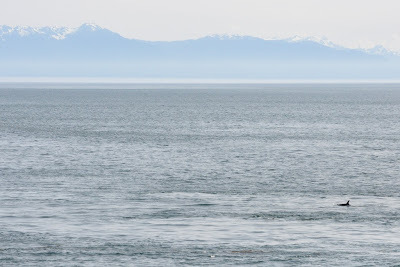 “I think I see a male about 800 yards off my 3 o'clock – I'm going to head out there.” Both boats slowly motor a little further offshore, somehow oblivious to the three or four whales quietly foraging not far from where they were just idling. More than three hours have passed since I got out here, and I'm starting to think about heading home. I think most of the whales have ended up heading back south, and I figure the small group way offshore to the north of me probably accounts for the rest of them. I put my camera and bincoulars away, but take one last look close to the shoreline to the north before I get up. My timing is perfect: I see a large splash. There are a couple whales porpoising back south. One of them is Granny. 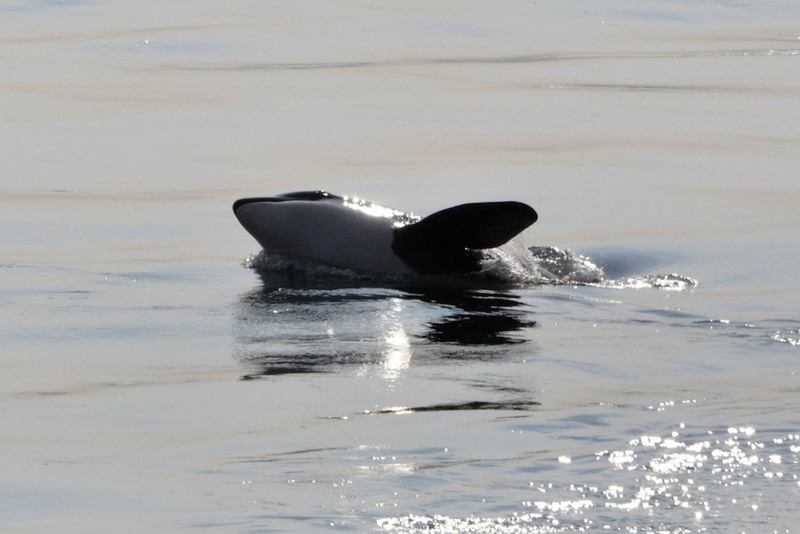 She's come back to rejoin the rest of her pod, but as is often the case, she's traveling with a purpose. Other whales have been lollygagging about, not really traveling anywhere in particular. In the meantime, she's been several miles further north and come straight back, perhaps surveying a little further for salmon. Two whales break off from Granny and slow down. They head towards the cliff where I'm sitting. It's L72 Racer and L105 Fluke. Racer swims under Fluke and pushes him partway out of the water, and he's upside down looking up at the sky. I wonder what he thinks of the view. It's a tender bonding moment between mother and son. After they pass by, I walk back up to my car where there is only one other vehicle parked in the pullout. An older couple is standing there, having spotted the whales and pulled over. They also just saw Fluke and Racer swim by together. The woman stands there, smiling as the whales continue south. “What a special thing,” she says to me. I try to think of something to say, but nothing comes to me. She's described the moment perfectly. I just smile back. A beautifully written story. I'm going to send a few friends to your website today! One of your best blog postings yet. I've got to agree with Vera. Nicely done.